Edward Segal founded our company in 1942 as a used machinery distributor in New York City. This was an opportune time to enter the used machinery business, as there was an abundant stock of surplus machines that had been used to support the war efforts. A great deal of this machinery was attaching equipment, primarily for rivet and eyelet applications. The challenge that faced Edward Segal Inc. during its infancy was to re-engineer the machinery so it would be attractive to industry. There were already several manufacturers of riveters, so the company focused its efforts on eyelet machines, where there were fewer competitors. To distinguish itself in the marketplace, the company developed a new concept where each machine was capable of simultaneously feeding and setting multiple eyelets. This new approach was difficult to market so the company built a few such machines for current customers. These machines were delivered along with an invoice; the customers agreed to operate the machines for 60 days and, at the end of the trial period, either return the machine or make payment. One such customer, a major manufacturer of electrical components, took ownership of these machines and went on to become our biggest customer! Since the early days, Edward Segal Inc. developed an extensive product line that now includes a wide variety of eyelet, grommet and rivet machines. Along with the core product line, we also possess the capabilities to design and manufacture custom assembly systems that utilize high-level operations such as pick-and-place, servo motors and sensors. The markets we serve encompass all major forms of manufacturing, including automotive, circuit boards, textiles, toys, electronics, tents, flags, banners, and a host of others. The changing face of manufacturing over the past few years provided the company with several growth opportunities. Beginning in 2003, Edward Segal Inc. began an acquisition spree to broaden its customer base. Gartz & White, a small company with a proprietary riveter, was purchased in 2003. That was followed in 2004 by the acquisition of New York City based Midward Supply Co., a company that specialized in rebuilt machines of the same type built by Segal. Ironically, Midward Supply Co. was formed in the early 1950’s, with Edward Segal himself as one of the founding partners. Finally, Automated Fastening Technology based in Milford, CT, became part of Edward Segal Inc. in September of 2005. With this acquisition, Edward Segal Inc. became the one and only Made in the USA company to offer its customer base fastening solutions for eyelets, grommets, rivets and snap fasteners. 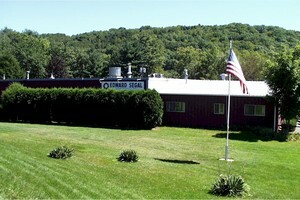 Edward Segal, Inc. relocated to Thomaston, Connecticut in 1972 from New York City and continues to be a family owned business, under the leadership of the 3rd Segal generation.